This 45-minute introductory tour of 10 or less takes you through New Orleans oldest above ground cemetery, St. Louis Cemetery #1. No longer open to the public due to vandalism, you are now required to have a guide. Through expert storytelling your guide brings the colorful history of one of America's most unique cities to life. Marvel at the beauty of the 200+ year old city of the dead. Learn how thousands upon thousands of people were buried within one city block. Learn about Voodoo and jazz music and the contributions of free people of color. This brief tour is something you will never forget. Meet-up with your guide in morning or afternoon near Conti Street and North Rampart, just outside the French Quarter, and begin with a brief introduction about the cemetery and history of New Orleans. 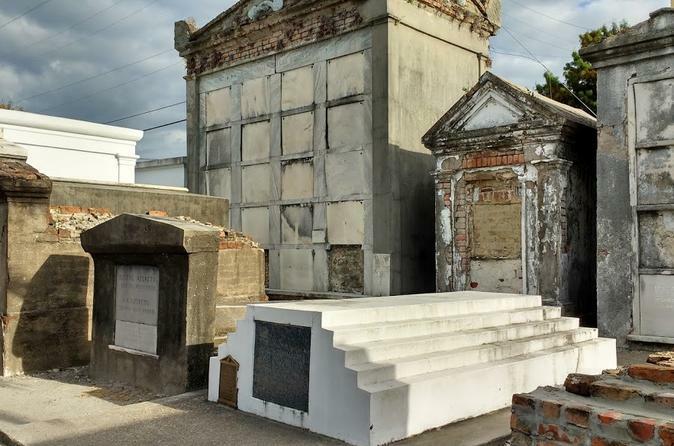 Take a leisurely stroll through the cemetery while your guide describes burial practices, and points out the tombs of Marie Laveau, Homer Plesssy, and Nicolas Cage and weaves interesting stories about the history of the city as you comb through the city of the dead. Cold water may be purchased near the door of the cemetery.